the story of Beatrix Potter’s life and achievements. For years, people have enjoyed the wonderful children’s classics given to us by English author and artist Beatrix Potter. Generation after generation of children have been delighted with her enchanting tales of Peter Rabbit, Benjamin Bunny, Mrs. Tiggy Winkle and their animal friends. picnic at the Blue Lantern Gazebo. The 1st – 4th grade multi-age group will make a Reader’s Theater and a bunny fact book. There will be a small amount of writing in the fact book – big kids will help little kids. The power of multi-age learning! All Pre-K & K student will begin the artwork of their special Reader’s Theater and will get to take home all pieces to complete with their family. All reservations must be made by or before Wednesday, April 6th, 5:30 pm. Minimum of 6 participants per camp. 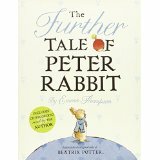 The Further Tale of Peter Rabbit by Emma Thompson.